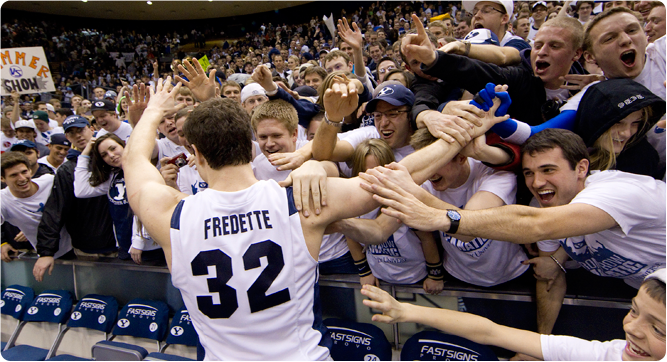 A stellar NCAA basketball or football season brings a flood of prospective students, says new BYU research—and it holds true at BYU. Watch BYU's new class of students, who applied post-Jimmer, create a giant human Y. President Spencer W. Kimball's address at BYU's 1975 centennial helped set the university's course. Read the speech and hear his voice in a campus time lapse. Happy birthday, Maeser Building! This Homecoming, BYU throws a party to celebrate the Maeser's 100th— and to honor all that the building represents. Diet and exercise affect employee productivity, says new BYU research, which suggests that expanding waistlines may shrink companies' bottom lines. Catch the sights and sounds of BYU's home opener, where LaVell Edwards Stadium debuted two new LED video walls. Replays are now better than ever. See Yale political science professor Susan Hyde explore why election monitoring became an international norm. BYU published an analysis on parenting children with developmental disabilities in the no. 1 journal on special education. After helping organize and direct a school for kids affected by leprosy, a McKay School professor shares his experiences. Full-time teachers working on a master's in educational leadership at BYU can now fit in their internships during the summer. How does the McKay School serve the Provo community? Read about BYU's public school partnership. American Heritage professors have danced in tutus and eaten goldfish to teach the nation's founding. Rich dads often have sons with high incomes, but new research shows it's more than Dad's money that helps. Through questionnaire analysis, BYU researchers are rooting out the secrets to strong relationships—and they can help you measure the strength of yours. Check out the lineup for the 2012–13 BYU performing arts season in a brochure now available online. BYU's annual World of Dance tradition has a new look—and a new name. Watch a sneak peak of the new show. See why BYU honored theatre and media arts professor Megan Jones at its Annual University Conference. Music professor Jeremy Grimshaw received a Young Scholar Award at BYU's Annual University Conference. Linguistics professor Cynthia Hallen studied Emily Dickinson's ancestral home of Shaftesbury, Great Britain. Kristin Matthews, professor of English and director of the American Studies program, was named an Alcuin Fellow at BYU's Annual University Conference. Three departments have new leaders. Find out who now chairs biology, plant and wildlife sciences, and physiology and developmental biology. The college honored 83 students at graduation in August. Read some words of advice given to the new grads. Beth Cole, the recently retired dean of the College of Nursing, leaves behind a legacy of service. Patricia Ravert, formerly the associate dean of the undergraduate nursing program, is now dean of the college. See what nursing students learned in Ghana as they faced poverty, limited resources, and tropical storms. In BYU's latest animated film, which has already won awards, a famed hairdresser faces his biggest test: a bald client. PhD student Paul Felt is using computer science to study texts from the time of Christ in an ancient dialect of Aramaic. Watch students in BYU's Global Engineering Outreach Club build homes for Navajo families in southern Utah. The National Science Foundation awarded BYU a grant to translate origami designs into engineered systems. BYU honored eight engineering faculty members at the 2012 Annual University Conference. Find out who was recognized. Should the president have the authority to make treaties? No, says Professor David Moore. Read more on his research. Check out a Jurist op-ed by Professor Carolina Núñez about the role of discretion in immigration law. The J. Reuben Clark Law School welcomed a new crop of first-year students. Read about the new class. Adjunct faculty member Jane Wise received an award at BYU's Annual University Conference. Read Marriott Magazine's feature on the late Stephen Covey, a man who enabled greatness in people and organizations. From Blake Griffin to steroid networking to a dog named Audit, listen in on Tanner Building buzz via Marriott Magazine. See the start-ups BYU students dreamed up that are winning national business contests—and $50,000 prizes. Watch rec management chair Patti Freeman's recent forum on the things that matter most. The new exhibit Think Flat features the pop art of Andy Warhol and Takashi Murakami. Are you a true blue BYU fan? Create a profile on BYUtvSports.com to share your spirit. Jack R. and Mary Lois Wheatley received a national honor for their gifts to education. Biology professor Richard Gill takes you on a wildflower tour of BYU's Wasatch backyard.